The second day of the prospect hockey's version of "March Madness provided new heroes stepping up to help their team in their quest for a championship in the CHL. In the USA, the field is technically set for the NCAA Tournament with just the decisions as to who gets seeded what number and where they get sent. 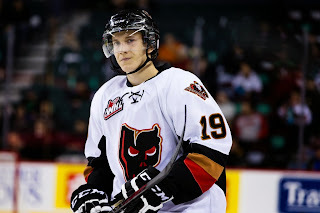 Really it is now a matter of when the New York Rangers decide to sign Adam Tambellini (NYR 2013 3rd) as Tambellini may have only played less than half a season for the Calgary Hitmen but Tambellini has shown that he can score almost at will but more importantly he can score on the power play. In game 2 of Calgary's series against the Kootenay Ice Tambellini earned the game's 2nd star after a 1-2-3 performance in Calgary's 5-0 win over the Ice. Tambellini with 2 secondary assists and his first WHL career playoff goal helped Calgary even their series at 1-1 as the series shifts to Kootenay for games 3 and 4 on Monday and Tuesday. In game 2, Tambellini got his evening going when he teamed with Brady Brassart to set up defenseman Alex Roach's goal at 1:33 of the 2nd period which put Calgary up 2-0. It was an even strength goal for Calgary who had really outplayed the Ice in the first but only had a 1-0 lead to show for it. The Ice would increase the pressure after the goal but could not get anything past Calgary goalie Chris Driedger and it would be Tambellini who would take the wind out of the Ice's sails. 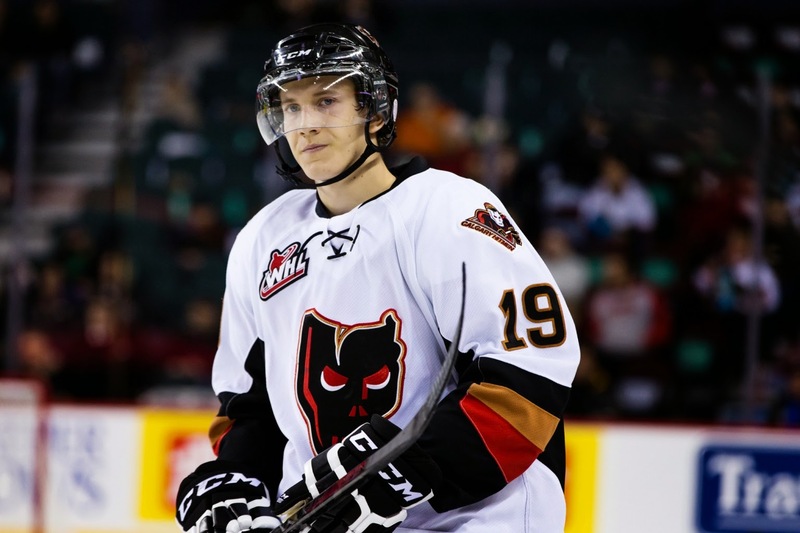 Tambellini scored his first WHL playoff goal at 17:32 of the 2nd period to give Calgary a 3-0 lead and then in the 3rd would team with his good friend Greg Chase to set up a power play goal that put the game out of reach. Tambellini is 1-3-4 after 2 games as the series will take Sunday off before resuming on Monday in Kootenay. Nothing against Griffin Reinhart of the Edmonton Oil Kings but right now it is hard not to consider Ryan Pulock (NYI 2013 1st) as the Islander's best prospect. 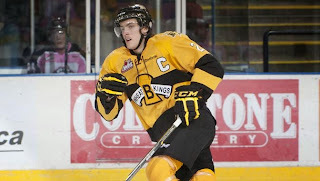 In game 1 of Brandon's series against the Regina Pats, it would be Pulock earning 1st star of the game honors in leading Brandon to a 6-3 win. Pulock with a 1-1-2 effort helps the Wheat Kings steal home ice from the Pats. Pulock's efforts don't show up on the scoresheet until the Wheat King's 3rd goal of the 1st period but his dominance going back to the last 3 games of the regular season has been showing. You want to see your captain show up in the big games and well there is no question Pulock at both ends of the ice is doing exactly that as Brandon now has won their last 4 games. On Brandon's 3rd goal of the 1st period, Pulock earned a secondary assist. In the second period with Regina having cut the score to 4-2, Pulock would score on an unassisted goal at 16:45 to make it a 5-2 game. Little did anyone know how big a goal that was as Regina would respond exactly 1 minute later to cut the lead to 2 goals again. Game 2 will be Sunday evening in Regina. The only one who makes a repeat performance from Friday night as Adam Pelech (NYI 2012 3rd) with his 1st ever playoff goal and a +3 helped rescue the Erie Otters from blowing game 2. The Otters earned a 4-3 win in overtime to take a 2-0 series lead over the Saginaw Spirit but they could rightfully be down 0-2. Pelech scored his goal off a nasty one timer just 43 seconds after Saginaw had scored to make a 2-1 game. The Otters who started slow in game 1 got a good start in this game but Saginaw would score 2 3rd period goals to force overtime. On defense, Pelech helped hold the Spirit to an 0 for 3 on the power play. The series shifts to Saginaw for the next 3 games and the Otters need to play better or this Spirit team will make a series out of this. Troy Donnay (NYR 2013 UFA) was scoreless and a -1 in Erie's 4-3 win over Saginaw. Donnay was on the ice for both of Saginaw's 3rd period goals which weren't his fault just wrong place at wrong time. Jesse Graham (NYI 2012 6th) had a secondary assist on Saginaw's 1st goal of the game and was a +1 for the game. Graham has been play 1st pair defense and doing a good job at it. Going to give Mackenzie Skapski (NYR 2013 6th) as pass for giving up 5 goals in Kootenay's 5-0 loss to Calgary. Besides the obvious lack of offense, Kootenay was short defensemen dressing only 5 and 3 of those defensemen were basically rookies. Skapski stopped 27 of the 32 shots he faced but he is basically going to need to shut out Calgary for the Ice to have any hope of winning this series. And sorry Calgary has too much firepower for that to happen. Kyle Burroughs (NYI 2013 7th) returned to the Regina Pat's lineup but was scoreless in Regina's 6-3 loss to Brandon in game 1. Burroughs had been out of the Pat's lineup with head/neck injuries missing the last 4 games of the regular season. Nothing against Burroughs as his team has done a great job this season but Brandon isn't your typical 7th seed and should steal this series. Loic Leduc (NYI 2012 4th) was scoreless with a +2 and a game high 4 hits as his Rimouski Oceanic spanked the Chicoutimi Saguenéens 6-1 to take a 2-0 series lead. Leduc was the starting defender for his Oceanic and his play has shown that he is deserving of that role. The Oceanic with their 2-0 series lead will now head to Chicoutimi for games 3 and 4 on Tuesday and Wednesday. Ryan Graves (NYR 2013 4th) was scoreless on 5 shots but his Val-d'Or Foreurs shut out the Acadie-Bathurst Titan 3-0 to take a 2-0 series lead. Graves was 1 of 4 players on the Foreurs with a game high 5 shots. Series shifts to Acadie-Bathurst for games 3 and 4 also on Tuesday and Wednesday. Griffin Reinhart (NYI 2012 1st) had a primary assist as his Edmonton Oil Kings jumped out to a early 3-1 lead and then held off the Prince Albert Raiders 5-3 in game 1 of their WHL playoff series. Prince Albert rallied to tie the game in the 2nd period 3-3 and was in the game until the Oil Kings sealed the win with an empty net goal. It was that empty net goal where Reinhart earned his primary assist. The 2 teams will play game 2 on Sunday afternoon. Forward Anthony Duclair (NYR 2013 3rd)- missed game 2 of his Quebec Remparts series with Rouyn-Noranda as the Remparts won 7-3 to tie the series at 1-1. Goalie Stephon Williams (NYI 2013 4th) was the backup goalie for Minnesota State as they defeated Ferris State 4-1 to win the WCHA Tournament and the automatic spot in the NCAA Tournament that goes with it. With all the league tournaments having crowned their champions then what is left to see which teams will be part of the 16 teams in the NCAA tournament. Ranger prospects Brady Skjei of Minnesota and Steven Fogarty of Notre Dame are in while as expected Cristoval Nieves of Michigan missed out. For the Islander prospects Taylor Cammarata and Jake Bischoff of Minnesota will join Stephon Williams in the tournament while Eamon McAdams of Penn State is out.